When you're visiting Australia's largest and most famous city of Sydney tourism is almost endless. You could do about a thousand things or more but because you're only going to have the time to see and do the best, we thought we'd make a list our top ten tourist attractions and things to do in Sydney. 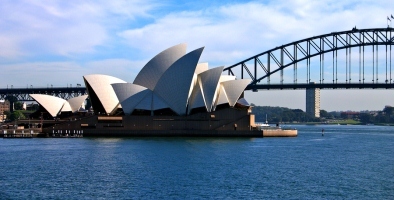 To come up with just ten things to do in Sydney is almost impossible of course and, no doubt, opinions will vary greatly depending on who you are and what you enjoy doing but we picked these out mainly because of personal experience and some discussion with family and friends. Let's give it a go mate! So if we could take you to our top ten places and things to do in Sydney this is where we'd take you... and in about this order. Sydney Tourism first stop, the harbour; Sydney Harbour is recognised as one of the most spectacular in the world and you can't come to Sydney without spending some time there. And of course while on the harbour I would put at the very top of the list of things to do in Sydney a tour of the Sydney Opera House, Australia's most iconic building. You'll discover the stories, history and magic of the Sydney Opera House with an incredible guided tour taking you underneath the world famous sails and you'll learn how Danish architect Jorn Utzon's ground breaking design and vision for a world class performing arts centre became a reality. Second and you'll need to be a bit fit for this, the Sydney Harbour Bridge Climb, which takes about three and a half hours. 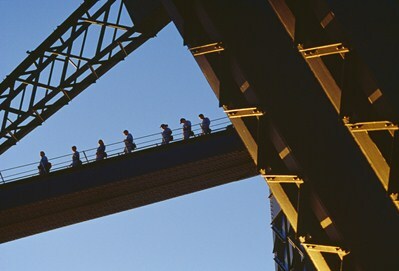 Your professional guide will take you along the outer arches of the bridge on catwalks and ladders up to the 134-metre (440-feet) summit, where you'll have an amazing 360-degree view of the city, the Sydney Opera House and the majestic Blue Mountains..... Now that's real Sydney Tourism. At number three, a Sydney Harbour Cruise, with more than 250 kilometres of bays, coves, beaches and promontories just waiting to be explored. On its foreshores you will see world famous landmarks and historical buildings while on the water itself, pleasure crafts mix with ferries, working boats, cargo vessels and ocean liners in a constant swirl of traffic. They sail from Circular Quay every day. At fourth spot a visit to the Sydney Rocks area, full of fabulous arts and crafts, coffee shops and restaurants. Step back in time as you wind your way through the cobblestone lanes and hidden pathways and discover the many hidden gems that await you. And next on the list of things to do in Sydney is a visit to Australia's iconic Bondi Beach; it's our greatest beach, probably one of the best in the world! It's sun, surf and sand and a world of lifeguards patrolling between yellow and red flags, surfers riding the waves, bronzed bodies and beach babes, comfortable cafes and smart restaurants. 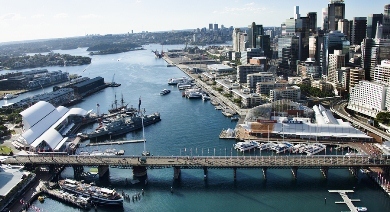 Now in sixth spot we've put in a visit to Darling Harbour, Sydney's favourite destination for leisure and entertainment with more than 40 restaurants, 30 bars, cafes, museums, theatres, parks and more. 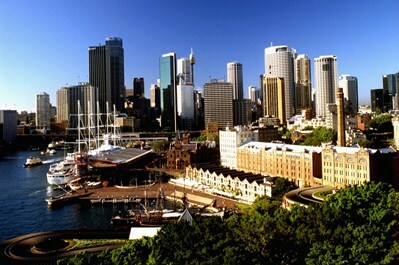 There are plenty of things to do for the whole family at Darling Harbour. Alright we're at number 7. 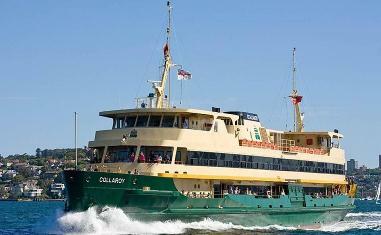 Sydney Tourism isn't complete without a ride on the Manly Ferry to the seaside suburb of Manly. The 7 nautical miles via the magnificent waterway of Sydney Harbour is the original and still best way to travel, arriving at Manly Wharf, a brand new food and wine oasis at Manly Cove.... You'll talk about it for years! At number 8, we're off to Taronga Park Zoo featuring Australia's finest collection of native animals and a wonderful selection of exotic species. 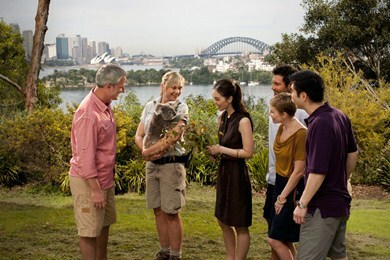 What makes Taronga Zoo something extra special is its location. It's on elevated land along the waterfront, in one of the most beautiful vantage points on Sydney Harbour overlooking Sydney Cove, the Sydney Harbour Bridge and the Sydney Opera House. 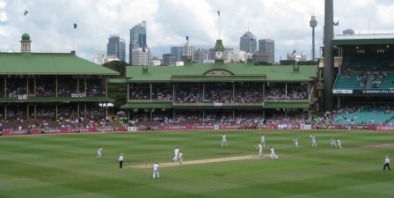 Next, a visit to the Sydney Cricket Ground; if it's cricketing season, we'd definitely go to a game at the SCG, the Sydney Cricket Ground is the major ground in Sydney for Cricket and Australia Rules Football. Originally opened in 1886, it's full of history and colour and a day there at the cricket is an amazing experience. Even if there's no cricket, it's still worth a visit. 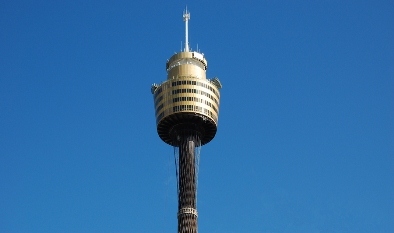 And finally at number 10 to finish off Sydney Tourism we'd take you for a great meal and some fine Australian wine at the top of Sydney Tower. Measuring 309 metres at its highest point, Sydney Tower is one of the tallest structures in the southern hemisphere and by far the tallest building in Sydney; the Eye Observation Deck is the best way to soak up the amazing sights of Sydney while you enjoy a beautiful meal. So there you have it. 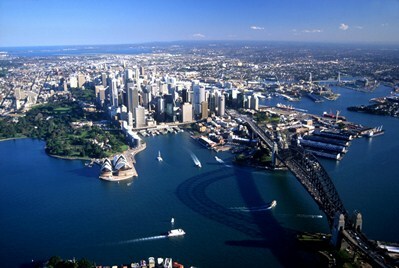 In our opinion they're the top ten things to do in Sydney; the best of Sydney Tourism. So what are you waiting for, come on down!